The plot of the book, to me, took a while to get to. While the main plot was kind of engaging, there were little side-plots here and there that seemed unnecessary, the most unnecessary being a sub-plot containing Uhura and Spock. Spock has no interaction with any other characters and just may as well not even be in the book at all. Also, reading that he looks down at Uhura's incredibly short skirt seemed incredibly uncharacteristic, even in this universe. Just thought I'd add that. 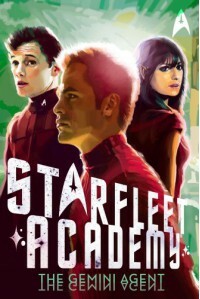 The main thing that I really liked about this book is the inclusion of Chekov, who is my second favourite TOS character. In the book Chekov is fourteen and just the cutest thing ever. My favourite parts of the book involved Chekov and he was the one character that just made me think "aww" whenever he said something that I found to be particularly adorable. A main feature of the book is Kirk's mysterious blackouts and I really liked how they were presented. I really managed to get a feel of what Kirk sees while he's blacked out through the writing, which gives quite a clear image. Overall, I didn't love this book, but I didn't not like it at the same time. For a book that only has thirteen chapters, most of the action appears in the penultimate chapter, while the rest of the book moves at quite a leisurely pace. I found the end to be a little bit predictable but I loved the inclusion of Chekov.